Jamie Burnett admitted he no longer enjoys snooker after being knocked out of the World Championship by Joe Perry. The Scot was beaten 10-7 in the first round by Perry on Monday, having been 6-3 up after the first session. Afterwards, Burnett revealed that he now finds it difficult to motivate himself for matches. "I don't really bother too much about snooker anymore, I've lost a lot of enjoyment from the game," Burnett told BBC Sport. "It's just not the same for me anymore, I'm 38 and I've been a bit fed up with it for a few years now. "I just play and, if I win, good. But, if I get beat, fine, good luck to the other guy. "I'm not calling it a day, I can't do anything else. It's just more of a job I don't enjoy. "I don't enjoy the travelling, it's a bit of a chore just now. I'm not even getting a lot of enjoyment out of winning matches. "When I qualified for the World Championship, I should have been really excited, but I wasn't. "I used to love playing the matches, but I'm struggling to get up for them now. "I should have been really excited today, 6-3 up at the worlds with a chance to play Ronnie O'Sullivan in the next round would have been awesome - and I was flat right from the start. "I've been very lucky to have been playing snooker for a long time and I'm certainly not sitting here crying about it. "I'm just saying I don't have the sort of drive guys like Steve Davis and Jimmy White have, still playing snooker at the level they are, for so long. "I don't know how they do it. They must really love the game and I'm one of the players that don't." 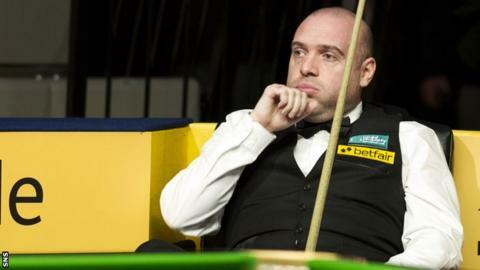 Burnett was investigated by World Snooker over match fixing allegations involving his UK Championship loss to Stephen Maguire in 2008 but denied that this had impacted on his feelings about the game. "People won't let it go, but if they want to talk about it, let them," he added. "I wasn't interested in it at the time and I'm not interested in it now. "I lost a bit of enjoyment before that, so it was nothing to do with that."